Just starting college or a new job? Eating fast food every day for lunch can get boring and expensive, so why not bring some healthy homemade meals from home instead? With this Great Wave insulated lunch bag set you will have everything you need to bring a delicious homemade meal to school or work in style! 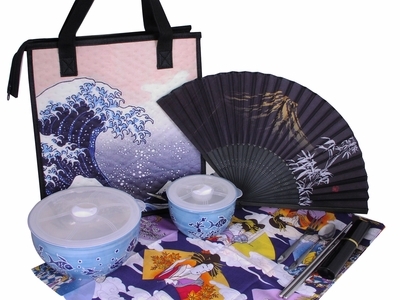 With a black fabric rim and handle, this Insulated Lunch Bag Set shows the famous Hokusai “The Great Wave off Kanegawa” printed onto the bag. Show off this stylish bag at lunch or even at the market as you store your frozen foods for a longer period of time. This eco bag also comes with a zipper on the top to enclose the temperatures for your foods stay constant until lunch time. Instead of the boring Tupperware you can buy anywhere, this set also includes two stylish Asian bowls with lids. They are dishwasher and microwave safe bowls with the “ocean” theme of the lunch bag and features fish in a coral reef in both dark and light blue colors. These useful ceramic bowls with lids are great for steaming as they have a “open” and “close” switch at the top to allow steam to vent. The smaller bowl would be great for leftovers that requires a small side dish of rice, salad, or maybe even dipping sauces. Also included in this set is a travel chopstick set that comes with a pair of collapsible stainless steel chopsticks, a small fork and a small spoon. In the case that your meal gets a bit messy or hot, this Great Wave insulated lunch bag set also comes with a beautiful towel and a fan! These traditional Japanese towels are known as “tengui”. Unlike typical Western terry cloth towels, tengui has a more smooth texture and can be used as a handkerchief, bandana, or placemat. Decorated in a deep blue with several geishas, clouds, and traditional designs, this Japanese towel can also be used to decorate your home and hang it like a wall scroll as a conversation piece. The handy Asian fan featuring Mount Fuji in this set is also great to use on hot days and if you prefer not to carry it around, you can also decorate your home or office space with it. COUPON CODE INELIGIBLE FOR THIS PRODUCT.